Ed, Edd n Eddy: Junkyard Scramble was a video game that was rumored to have been being developed by Crawfish Interactive and published by BAM! 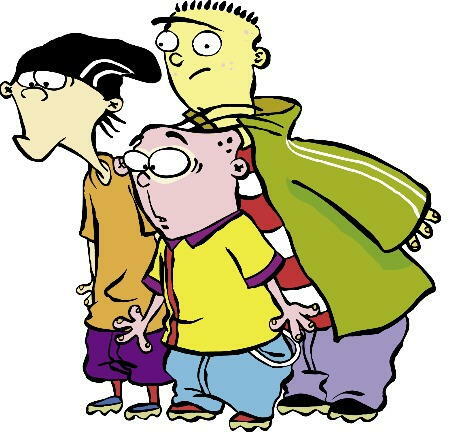 Entertainment, based on the Cartoon Network show Ed, Edd n Eddy. Very little is known about the game, as there are no screenshots or videos that have resurfaced online. It was apparently a puzzle game and cost $29.99, according to a listing by JJGames. It is also listed on various others sites such as IGN and even an eBay listing, albeit unavailable. The game was apparently cancelled in favor of Ed, Edd n Eddy: Jawbreakers!, later released on Game Boy Advance. On October 1, 2017, user Comikid uploaded a video to his Youtube account detailing his interactions with Cameron Sheppard (an employee at Crawfish Interactive at the time of the game's rumored development) about the existence of the game. Cameron eventually got back to Comikid, claiming that he and several other people couldn't find anything related to the game on their computers, meaning that everyone was likely confusing the game for Jawbreakers. Comikid's videos on the subject.